As Andy Harding points out, the title of his new EP was obvious really… “Storytelling” is a collection of three compelling story-songs that open windows on a range of characters from a past age that feels at once so far away and yet still so close to us today. The opening track, “Little Piece of Tin” captures exactly the modest and unassuming attitude displayed by so many that returned from active duty in the Second World War. There was little bragging about heroic deeds, but a private pride in their achievements and in the medals they had been awarded. The protagonist of Andy’s story was forced to sell his precious medals later in life as times became hard but …. well, as Andy says, listen to the story! The arrangement on this song has a touch of “Where do you go to my lovely “by Peter Starsted about it… enough in itself to bring on nostalgic feelings! “Where Charlie Once Stood” is a elegiac portrait of the New Palace Theatre in Plymouth, that today is virtually derelict. The song cleverly brings the theatre back to life with the sounds of laughter and the music and stars from its heyday in the days of Music Hall. This is a nostalgic look back to a time before people lived such self-absorbed lives at home with TV. Are you suggesting people should get out more and listen to live music, Andy? While listening to the final track on the EP, I was reminded of two of my favourite Richard Thompson songs mainly because the characterisation of the two main subjects of the story told here are as vivid as Thompson’s star-crossed lovers in “Beeswing” and James Adie and Red Molly from “1952 Vincent Black Lightning”. In “Prince of the Waltzer” Andy creates a grand romance from everyday people, with beautifully chosen details like the unmistakeable smell of fried onions and diesel! The fairground music that sets the atmosphere leads into a tune and chorus that flow beautifully, allowing the story to be told smoothly …and to finish the EP on an up-note of positivity. Andy’s voice is at its best in this last song, but throughout the EP he has an engaging rich tone that keeps the listener focussed on his beautifully constructed stories. The lyrics are unfussy and scrupulously avoid cliché or anything too obvious, and his ability to focus in on one or two apparently minor details brings the pictures to life. The tunes Andy has written for these stories complement them perfectly – not maudlin or over sentimental, just the opposite in fact, which allows the stories themselves to carry the emotional content. These songs, and the stories they tell will remain in your thoughts long after listening. 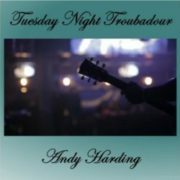 “Storytelling” by Andy Harding is available as a download from amazon.co.uk.